All Mess Tents come with poles, guys and pegs. If groundsheets or mallets are required, they should be ordered separately. 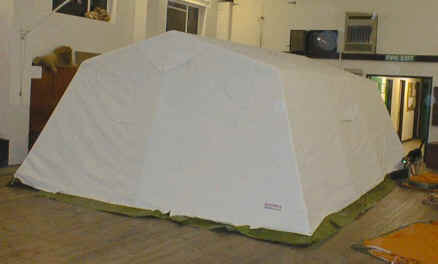 We have three sizes of mess tent, half (7’x7′) DB, small (14’x14′) DD and large (19’x14′) DE. These are general purpose cooking/activity tents and are very easy to erect. We have a groundframe for one of the small mess tents, which allows the tent to be pitched on a hard surface. Some of the more recent ones are suitable for leader sleeping tents; each DI inner sleeps one or two people. 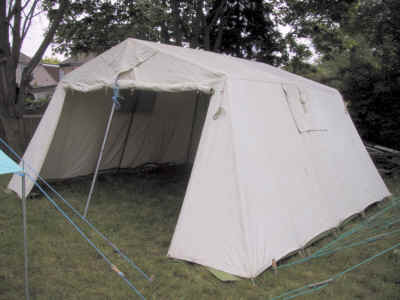 The DD tents can take up to three inners, the DE tents four. Now lift the frame put the legs to full height. It is best to lift a side at a time, ideally using three people for the small mess tent or four for the large mess tent. Once both sides are lifted, put the centre poles in. All that remains to be done is to peg the tent down around all the edges and peg the storm guys.